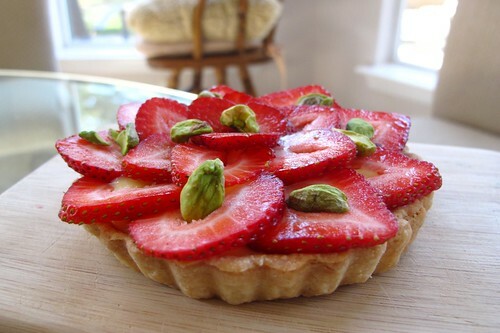 However, it reminded me of the strawberry tarts I made a few weekends ago. While I enjoy watching Barefoot Contessa (it's one of the only cooking shows I can still stand to watch on the Food Network without cringing), this is only the second recipe of Ina's that I've followed word for word. I have to say, they turned out pretty well. The pasty cream filling is ridiculously easy to make and just as good as I was hoping it to be. Next time, I'd splurge and add in some vanilla bean instead of only "good vanilla" extract ;) I also didn't have any cognac on hand so I had to omit it from the recipe. The crust, was only satisfactory. There wasn't enough of a deep, rich, buttery flavor. However, it was very flaky. Once assembled, I noticed that some refrigeration actually helped the crust and pastry cream mingle a little more--resulting in more of the usual tart crust texture. I got this recipe off of Food Network's website and it worked perfectly. The only thing I changed was the sugar content in the pastry cream. I usually reduce the amount of sugar in any recipe--especially if it's an American recipe. Americans have such a severe sweet tooth it's a little ridiculous. Also, since I don't own a large enough food processor, I made the dough for the tart shells in a stand mixer instead. 7. place a piece of butter aluminum foil (butter side down) on top of the filled tart pans and fill with dried beans or rice. bake or 10 minutes. remove beans and foil, prick bottom of shells all over with a fork, and bake for another 15-20 minutes until lightly browned. set aside to cool. 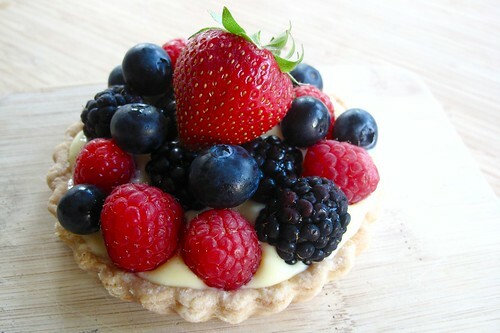 8. before serving, fill tart shells with pastry cream and arrange berries decoratively on top of the cream. sprinkle with pistachios. 2. with the mixer still on low, slowly pour the hot milk into the egg mixture. mix. 3. transfer mixture into a medium saucepan and cook over low heat, stirring constantly with a wooden spoon, until the mixture thickens, 5 to 7 minutes. 4. when the custard comes to a boil and appears to curdle, switch to a whisk and begin beating vigorously. continue cooking and whisking for 2 minutes until the custard comes together and becomes thick like pudding. 7. place plastic wrap directly on the custard and refrigerate until cold. Nice write-up and pictures! I recently purchased a tart pan and have been making tarts for dinner parties. 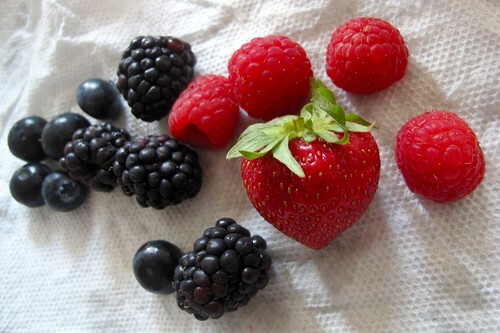 I should make one with strawberries since they're so in season right now. Totally agree about the pistachios; I'd leave them out too. 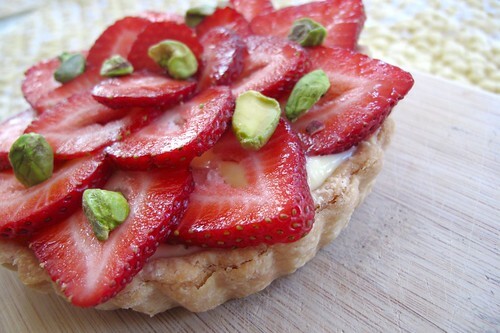 Your strawberry tart looks absolutely amazing! And the pistachios are indeed good for looks! I am saving this recipe! Thanks. I love tarts! too bad I don't have a tart pan :(. mm looks awesome!! you're making me so hungry!